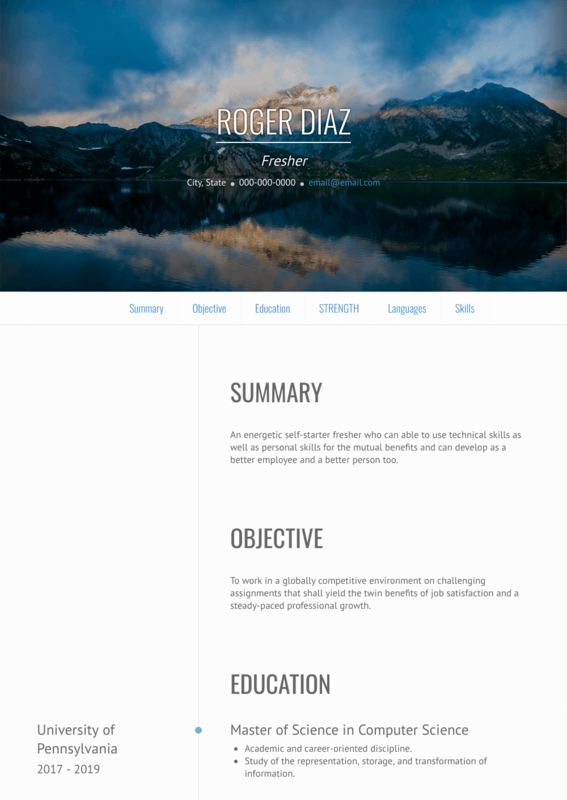 This page provides you with Fresher resume samples that you can use for inspiration in writing your own resume, or for creating one through our easy-to-use resume builder. Below you'll find our how-to section that will guide you through each section of a Fresher resume. First of all, congratulations on your graduation! We get it, we have all been there: you’ve recently graduated and you feel like you lack significant experience. You have little idea on how to write the best resume and you don’t know where to start. Well, let’s start from the fact that you’ve landed on this page, most likely looking for the best fresher resume sample on the web: that’s already a first step! We are here to help you building that standout resume that will convince the recruiter to give you a chance and to invite you to the office for an interview. Now, your resume is your introduction: to the recruiter, to your future employer, to the company and to the job itself. Don’t rush, sit down and relax because this extremely important step of the process will define your future couple of years. Let us inspire you, we have already helped thousands of graduates like you getting the dream job they were hoping for! Most resumes don’t get more attention than 15 seconds: did you know that? Crafting a strong graduate resume is not only important, it is mandatory! As per the format, differently from other resumes, there is no set in stone format: what is strongly suggested though, is a resume objective section, where you match your career objective and goals with the responsibilities and requirements provided in the job description. Make sure you spend 15 minutes studying the company’s business, mission and values: the recruiter will definitely appreciate if you explicitly mention or reference to those. Education and internships are obviously very important, but we’ll cover them in depth later. Use a friendly yet professional tone, don’t be too simple nor boring: and please, don’t be funny! This is not a conversation you’d be having at the cafeteria! Clear, powerful fonts are a must: even if you’re very young, basic fonts are your best option as they can be more impressive than one that’s impossible to understand for the recruiter. If you want to use many colors, we suggest you attend a painting class after-work! This is a professional resume and your future employers might think that it is a bit childish to have a rainbow on it. Big headings, clean white spaces and no typos are fundamental, too! Last but not least: save your resume as .pdf, as unfortunately MS Word won’t keep your layout intact. How many graduates resume would you say a recruiter and hiring manager get on a weekly basis? Did you say 10? Wrong. Higher. The competition for graduates is insanely fierce and many of you lack experience: you can win the recruiter’s attention in one way, and that’s through your summary. In fact, this is your 60-second pitch to the recruiter, your chance to convince them that you are worth scrolling down your resume. A perfect summary should be succinct and precise which means short and not vague. Make sure you showcase your best wins at school or during your internship and you make this section count! Say you will be the “best graduate” more than once. You might think “Why would I even fill this if I either have no experience or have only done one internship”? Well, we strongly suggest you make that internship count! What, out of the responsibilities you had, can focus on to get a recruiter interested? What qualities did you develop that could ensure you don’t get forgotten amongst the many other applicants? What skills have you worked on during that experience that can match the job description? See, it’s not too difficult! Don’t forget to use bullet points to showcase the aforementioned: the recruiter will appreciate such an organized layout. Education is fundamental for a fresh graduate like you. And, after all, this will be your easiest section to fill as you recently finished your studies. You shouldn’t stop here, though? Can you make your education look more impressive? Did you receive or undertake any educational training? Did you get any extra-courses or certifications that match the description of the job you are applying for? Make sure you include them! This is a very important section for a fresher resume as client’s are searching for specific skills that their hire must have to complete the job.